Blurb Description: In a galaxy powered by the current, everyone has a gift. Akos is the son of a farmer and an oracle from the frozen nation-planet of Thuvhe. Protected by his unusual currentgift, Akos is generous in spirit, and his loyalty to his family is limitless. Once Akos and his brother are captured by enemy Shotet soldiers, Akos is desperate to get this brother out alive — no matter what the cost.The Akos is thrust into Cyra's world, and the enmity between their countries and families seems insurmountable. Will they help each other to survive, or will they destroy one another?Carve the Mark is Veronica Roth's stunning portrayal of the power of friendship — and love — in a galaxy filled with unexpected gifts. Before I begin, CONFESSION TIME! Carve the Mark is my first book by Veronica Roth – I didn’t read, and honestly have no intention of reading the Divergent series. A few years ago, when I started blogging, I read a spoiler about the ending of Allegiant and it made reading the whole series kind of pointless. 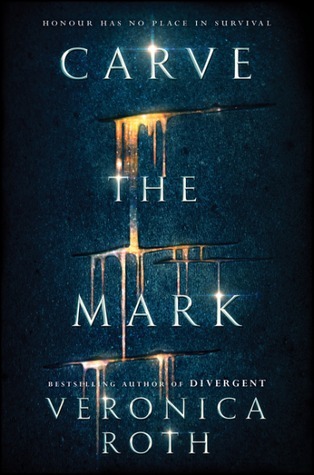 Before I started reading Carve The Mark, or even before my copy arrived, I heard a lot of people saying that things in this book were truly offensive. I spoke to a bunch of people over the internet, and learned what it was all about. Although a large number of people WERE saying that they were boycotting the book I a) don’t engage in book hate and b) had already made a commitment to Harper Collins that I would review this book for them which I would never back out on. Truth be told, I enjoyed the book. A LOT. I will be talking about MY OPINIONS about the controversies this book contains below, but I will review it first. In a galaxy ruled by the Assembly, the planet of Thuve is on the brink of Civil War. Known mostly for their production of Hushflower, which is used for numerous medical and educational purposes, it has two warring people – the Thuveists and the Shotet. All planets have three Oracles – one Falling, one Sitting and one Rising who see the various futures for their planets and all the people in them. Over the galaxy, there are nine fate-favoured families, whose fates remain mostly the same in all possible futures. Cyra Noavek, sister to the Shotet Sovereign, and inflictor of pain with a single touch is one of the Fate Favoured Children. As is Akos Kereseth, son of a Thuveist hushflower farmer and the sitting oracle. Determined to change the fate the oracles have seen for him, Cyra’s older brother kidnaps Akos and his brother, Eijeh and nobody’s life is ever the same. I found it REALLY EASY to slip into this world. After just the first chapter, which was a little strange, it was REALLY fun to get to know more about the Galaxy and the planets in it. 1. THE WORLD BUILDING: Although the origin of the Current itself was vague, EVERYTHING else about this world was REALLY well described. When I was in Shotet (where most of the book is set) or even in Pitha, I FELT IT ALL. The scavenged lifestyle, the savagery, the tradition. It felt like they were a real people with a real country and real beliefs that they upheld, MORE than any book in ever. 2. ISAE AND CISI: While they don’t show up until we reach the end, and we don’t even see much of them, for some reason they TOTALLY captured my heart? I love it when LGBT couples are openly accepted in a fantasy book – it make me REALLY happy. 3. CYRA AND AKOS’S ROLES: In most books, the guy is the alpha male and the girl is the clueless dainty little thing. While NEITHER of them were clueless, I felt like they didn’t follow traditional roles/ book tropes and were INDEPENDENT characters struggling with their own flaws. Some of the things I didn’t like in this book was the romance between Cyra and Akos, when it began. I thought that they were BETTER friends, but I slowly warmed up to their relationship. I’m not a shipper, but I’ve made my peace with it. Another thing that annoyed me was Sifa Kereseth, Akos’s mom. I understand duty and being ruthless, but HOW CAN YOU BE BOTH? All in all, a book I REALLY enjoyed – a fast paced, brutal fantasy with beautiful world building and characters! 4 stars. I fully acknowledge that people have been hurt by Veronica Roth's words, and I cannot apologize deeply enough for it. I'm so sorry for any injustice you have undergone or hurt you have felt. I do, however, want to tell people that if they WERE/ ARE interested in the book, they should still read it and THEN if you find it offensive, SPEAK UP because your voice MATTERS and speaking up with all your facts correct is IMPORTANT. I still apologize to the people hurt by this book. If there were any other issues YOU found in the book, I haven't heard of them, so please feel free to talk to me about them. I asked people on Instagram what the controversy was, and I had conversations with over 10 people, and found out about the TWO MAJOR issues everyone is claiming this books has. I also noticed that a LOT of these people HADN'T EVEN READ THE BOOK, and had simply bought into the negative hype. The first was that the planet that the book was set on had a half black population that behaved savagely and a white population that was peaceful. WHILE the MAIN CHARACTERS, Cyra is described as dark skinned and Akos is fair skinned, it is NOWHERE mentioned that the ENTIRE POPULATION of either nation is black or white. The second was a little harder. In an interview with Entertainment Weekly, Veronica Roth said that the 'gift' the Cyra had was based off of Chronic Pain. I don't suffer from the disease, and it did make me reluctant to read the book, but Chronic Pain is NEVER ONCE Portrayed as a blessing, or a good, comfortable thing, but as I said, I'm NOT someone who can accurately talk about this. 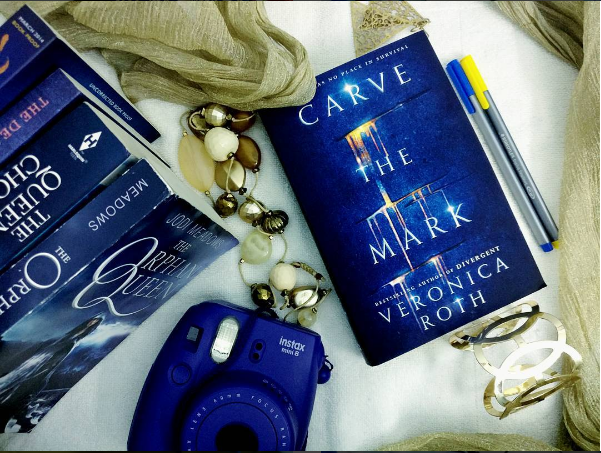 Have you read Carve The Mark? What so YOU think of the negative hype surrounding the book? What is your favourite fantasy novel set in Space? If you think I'm wrong with anything I've said, please do discuss it with me in the comments below.